YEEEESSSS... it’s finally here T&T Carnival 2011. So for the CNz family we decided to do something special this year and have a pre T&T carnival fete for allyuh, yeah that’s right and it's absolutely FREE for ALL 2010 CNz masqueraders. CNz T&T Carnival warm-up features some of our family of DJs and hosts and will also give us the opportunity to OFFICIALLY LAUNCH OUR 2011 THEME!!! Doh ever say that CNz don’t appreciate its entire family or masqueraders, DJs/Hosts, volunteers and core CNz peeps. As we get prepared for the madness that is T&T carnival... come fete for FREE with CNz and set your sights on what is to come for CARIBANA 2011 from CARNIVAL NATIONZ!!!!!!!!!!!!!! 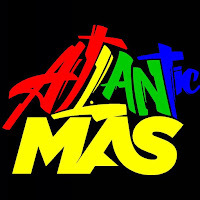 Saturday 22nd January@ TWILIGHT – is plenty MAS & WINING CNz-style!!!!!!!!!! 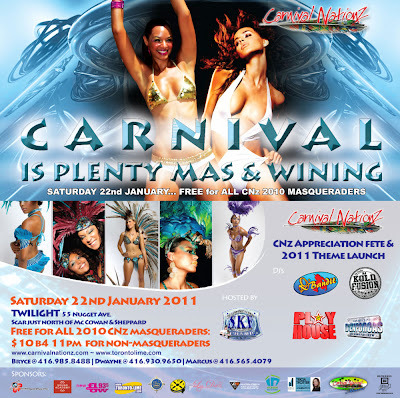 CNz APPRECIATION FETE & 2011 Theme Launch... FREE to ALL 2010 CNz masqueraders!!!!!!! FINALLY!!! I actually appreciate the late theme launch, we wont have to wait as long with anticipation of how what the sections will look like.